The plastics industry supports the collaboration of multiple stakeholders to create of a circular economy of plastic. This should include increased collection, reuse where possible and the use of compostable materials in suitable applications alongside necessary collection and processing infrastructure. Q – Where does plastic in the ocean come from? 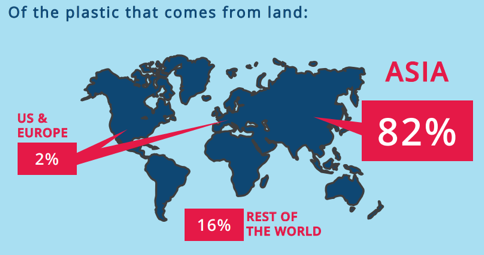 Most comes from land, mainly from countries outside the US and Europe where many people do not have kerbside collection and instead rely on open dumpsites near waterways. Q – What does the UK contribute to plastic in the ocean? Litter from items consumed outside the home – this can fall into drains or waterway or be littered on beaches. Abandoned fishing gear and items thoughtlessly flushed down the toilet (e.g. cotton buds). Technical Report by the Joint Research Centre (JRC), the European Commission’s science and knowledge service. Marine Beach Litter in Europe. 2016 Project Aware – Dive Against Debris. Annual Review 2016. Q – What is the industry doing to help stop plastic entering our oceans? Education programmes, phasing out microbeads, preventing raw material loss, innovative campaigns on littering and sharing of best practice. Q – Why packaging? To save resources, such as food and product waste that occurs on the way to the store and while on display. Packaging typically reduces supermarket food and product waste by about one third. Q – Why plastic? It’s light and provides unique benefits (e.g.. packaging fresh produce). You can use less plastic than other materials to do the same job. Producing plastic uses half as much energy and results in much less carbon being emitted than alternatives. Q – Why isn’t it all plastic biodegradable? Products that are easily recyclable should be recycled to enable the reuse of the material. Small items and those heavily contaminated with food may be suitable for composting. However, we need to make sure they don’t get into the recycling stream (where they can cause issues) and are collected for special treatment (industrial composting). Most materials only biodegrade in special conditions, which are not met on the street, in the ocean or in landfill, so they should never be littered. Q – Isn’t plastic difficult to recycle? No – 74% of plastic beverage bottles are recycled. The UK recovers 80% of all plastic packaging. The UK is also the 7th best recycler of plastic packaging waste in Europe (out of 30 countries). Q – What about black and coloured plastic? Currently, waste management companies have difficulties separating black trays, but once separated they can be recycled. New smart detection systems can solve this problem. Some black trays already contain 98% recycled content. Q – Can films be recycled? Yes and 17 member states in Europe already collect all plastics packaging from households. The UK should follow their lead. Q – What is the way forward for plastic packaging? In the UK, we should expand kerbside collection, improve collection outside of the home, provide clear communications on recycling and implement strong anti-litter campaigns. If we stopped using plastics we would consume more overall resources and have no less litter.